Further falls in the Shanghai Composite spooked the silver market in early trading with the initial losses then partially recovering as crude oil prices soared following much better than expected inventory data at Cushing. Whilst silver prices closed the session marginally lower the daily candle ended with a deep lower wick suggesting that a degree of bullish sentiment has now re-entered the silver market and as a result we should expect to see a small rise in silver prices in early trading tomorrow. 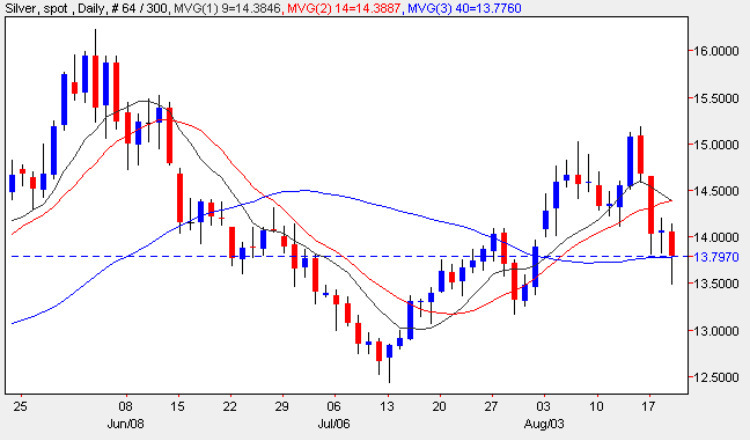 This analysis of the silver market is reinforced by the fact that the close of the day seemed to find support from the 40 day moving average once again, confirming the previous two days where both candles also found a modicum of support. Whilst silver prices remain relatively range bound silver trading will be limited to intra day opportunities rather than longer term position trades and any rise in silver prices tomorrow may be limited to the underside of the next resistance level at $14.26 per ounce price point. Only a break and hold above the $15 per ounce level will indicate that a reversal in sentiment has occurred. As always silver trading must be seen against the backdrop of the summer lull, thin markets and frayed nerves in equity markets which will continue until September when most markets should be back operating at full capacity.